Consuls from Japan, Korea take part in ceremonial resolution adopted by county commissioners to honor Asians and Pacific Islanders, who constitute 11 percent of the county's population. Washington County commissioners have recognized Asian and Pacific Islander Heritage Month with participation from the consulates of Korea and Japan. 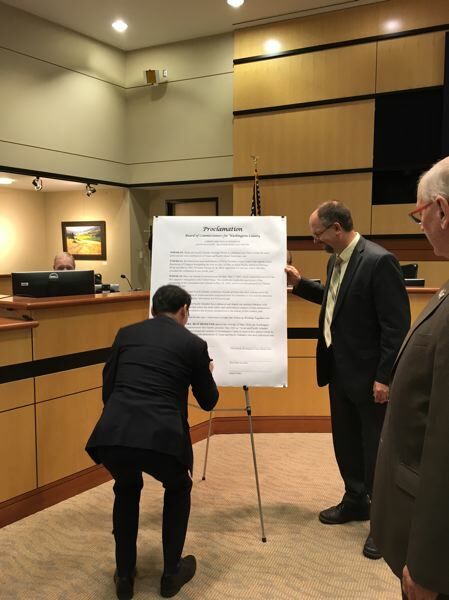 The resolution was signed May 1 not only by Board Chairman Andy Duyck but also by Lee Hyung-jong, consul general of South Korea based in Seattle, and Takashi Teraoka, consul general of Japan based in Portland. 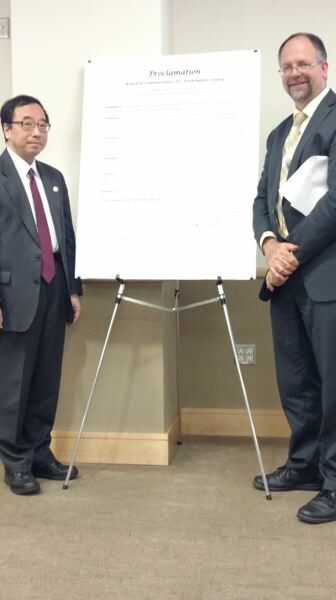 Lee signed during the board's business meeting, and Teraoka did so afterward at a county reception honoring the Asian American population. "It is truly important to understand other people and other cultures so that they can communicate and cooperate with each other," Lee said. With a total 11 percent of its population identifying as Asian or Pacific Islander, Washington County leads the three Portland metro counties. In Multnomah County, the total is 8.2 percent, and in Clackamas County, 4.7 percent. As of July 2017, the latest count available, about 4.4 percent of the Washington County government workforce is of Asian or Pacific Islander descent. "Our goal is to strive for an organization that reflects the ethnic and racial diversity of the community we serve," said Philip Bransford, a county spokesman. "We're working diligently to recruit and retain employees to meet this diversity goal over time." The board adopted a similar resolution and conducted a reception Feb. 6 in honor of Black History Month.